We will leak test your suit. The cost of repairing small punctures is included in the test price. If we find a bigger problem, we will contact you with recommendations to see what you would like us to do further. Once we’ve completed the repairs, we will retest the suit to check the work. Oceaneric uses only top quality latex ‘seamtite’ seals. We would prefer you to try on the seals prior to fitting them to the suit, to ensure they are the correct size and comfortable. We offer a full range of cuff seals from, conical / universal, bottle, manchette, etc. Most of these are available in standard and heavy duty. Leaks on drysuits can be tricky things, you fix one, retest the suit only to find another sneaky little one in another place. Sometimes with leaking seams we can make a repair, but often if the seam is starting to break down it’s not cost effective to repair it. A patched seam can last for years, or it can just be a temporary repair. We’ll give you the benefit of our experience. 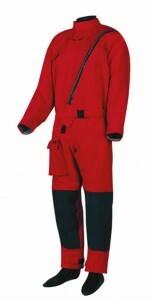 Note that we also repair suits for surface use such as: sailing, fishing, kayaking, commercial, SAR, military and emergency services. Please contact us to discuss your requirements. Duration: Oceaneric can usually leak test and report on your suit within 24 hours. Note that the suit may be wet on the inside after testing, so it will require a further 24 hours to dry it. Seal repairs can usually be completed within five to seven days. We’re sorry but we can only guarantee the work that we do, i.e. the bonding of the seal to the suit. We can not guarantee against damage to the seal done by the diver. 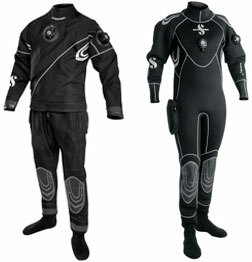 Oceaneric can also repair wetsuits, drop us a email with a picture of the repair or alteration you would like and we will get back to you. Copyright © 2019 Oceaneric. All Rights Reserved.